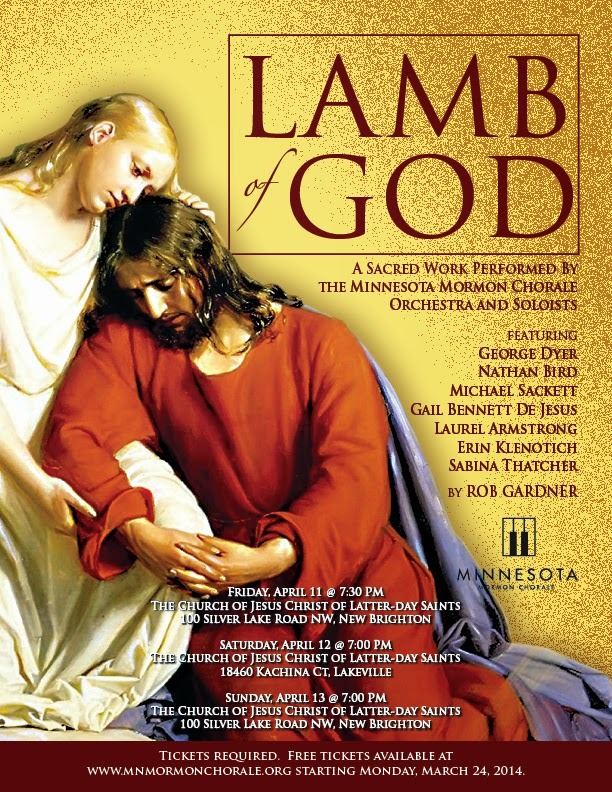 Now that our spring concert is over and we are truly in the Easter season, our focus in the Chorale has once again turned to Rob Gardner's gorgeous oratorio, Lamb of God. Always the highlight of our spring season, the piece focuses on the last days of Christ's ministry on Earth. This year I've been trying to let myself get lost in the doctrine as well as the music. In addition to making notes on dynamics and rhythms, I've been writing personal notes to myself in the score as we sing: "Who am I representing, here? What is my character feeling? What am I feeling?" Doing this has helped me connect to the piece emotionally, and today in rehearsal it struck me in a very personal way. We were practicing I Am the Resurrection, and we had the opportunity to talk about Lazarus and "the fourth day". In Jewish cultural tradition, it was believed that the soul hovered near the body for three days after death, but after that time had passed there was no hope for the deceased to ever live again. When Christ came to Mary and Martha, Lazarus had already reached his fourth day. There were few who believed that he could rise again. Lazarus rose. Those who had lost hope were absolved - their prayers had been answered. Their trial was waiting: they needed to have hope until the fourth day. As we talked about this, our director asked us if we could think of any time where we were made to wait until the fourth day. I wrote it down in my score, and immediately knew what I would say if I could bring myself to say it out loud. My "fourth day" was the day I let myself become converted to Christ. It had been two years since I had been to church. I was bitter and sad - there were so many things about the church that I didn't understand, and so many ways I felt I had been abandoned by God. I was tired of fighting, and I was sick. Very sick. My lungs, which have fought against me for my whole life, were full of fluid; my throat so raw that I couldn't move or swallow without sharp pain. I couldn't breathe. I couldn't even cry. I thought that I was going to die, and I had never felt more alone in my whole life. Suddenly, I wanted a priesthood blessing more than anything else in the world. I called my long-suffering home teachers, and they agreed to come over as soon as possible (privately, I think they probably high-fived each other right after I called). As I had my priesthood blessing, I was hit full-force by the power of God's love for me. I was immediately aware of the spirit in the room, and of the truth of all the things I knew. The gospel was true, I would get well, and my life would now be full of light. In spite of my struggles, I could, and would be whole again. I may have not been as close to physical death as I believed myself to be (and certainly not as dead as Lazarus), but I was hovering on the edge of a spiritual death that I don't think I could have ever come back from. The tiny sliver of faith I showed when I asked for a blessing that night - the faint hope and belief that God would help me - saved my life that night. I had been in a tomb made of my stubbornness and hurt, and Christ brought me back into the light. There is always hope for us. Christ is our champion of second chances. He died so that we could live again! He lived and loved so that we could learn how to live our lives in the best way that we can. This Easter season, as we go through the season of Lent (or sing beautiful music) to remember the ministry of Jesus Christ, I hope we can all think about our fourth day. I hope that we will think about those dark times in our lives, and come to know that Christ will always be there to lead us into the light.